The Bed & Breakfast Bootleg! Exclusively for BBMIS members, the first Bed & Breakfast Men bootleg CD is here! 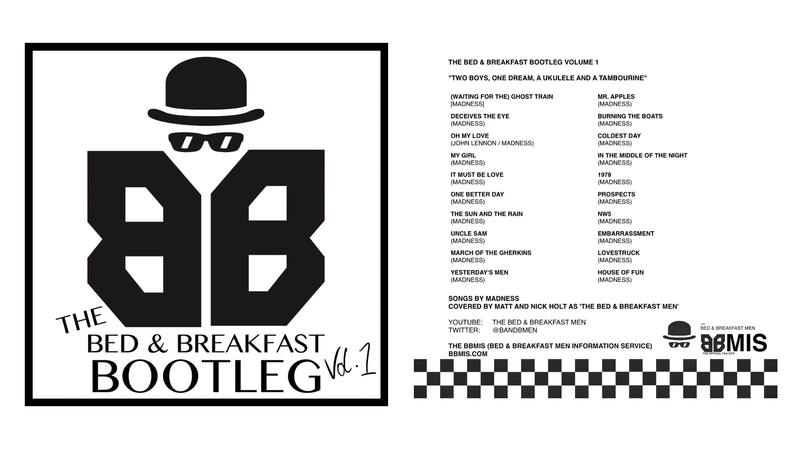 Entitled “The Bed & Breakfast Bootleg Volume 1“, the authorised bootleg CD includes the boys’ first 20 covers in audio format especially for your offline listening pleasure. From ‘(Waiting for the) Ghost Train‘ to ‘House of Fun‘, ‘It Must Be Love‘ to ‘Mr. Apples‘ – even “Oh My Love” originally by John Lennon, covered by Madness, and now again by our favourite ukulele/tambourine-wielding duo, The Bed & Breakfast Men! The bootleg will cost ten of your British Pounds, and that includes P&P if you’re in England, Scotland, Ireland or Wales! After the sale I’ll be able to upgrade the website to have a wider range of customisation tools, including shortening the address and getting rid of those pesky ads! We’ll also get some extra space on the server so that we can continue updating the site far into the future. By buying this bootleg you are also contributing to Mad Chat’s current cause ‘Julia’s House‘, which there will be a more detailed post on soon. To get your hands on one of these half-decent bootlegs just leave a comment under this post, and if you’re one of the first 10 I’ll contact you with PayPal details. If you miss out, don’t fret! This means the CD proved to be popular, so there will most certainly be more made available in the near future! Author String WestPosted on May 14, 2017 May 14, 2017 Categories Fan site14 Comments on The Bed & Breakfast Bootleg!